Sporobolomyces is a yeast commonly isolated from environmental sources, such as air, tree leaves, and orange peels. The natural habitats are humans, mammals, birds, the environment, and plants. Sporobolomyces may cause infections, particularly in immunosupressed patients. Its telemorphs are included in the genus Sporidiobolus [531, 1295, 2202]. The genus Sporobolomyces contains about 20 species. The most common one is Sporobolomyces salmonicolor. See the summary of synonyms and telemorph-anamorph relations for the Sporobolomyces spp. Sporobolomyces has so far been reported to cause infections (lymphadenitis) in patients with AIDS [1579, 1812]. Dermatitis , cerebral infection , and fungemia  due to Sporobolomyces have also been observed. Sporobolomyces produces yeast-like cells, pseudohyphae, true hyphae, and ballistoconidia. 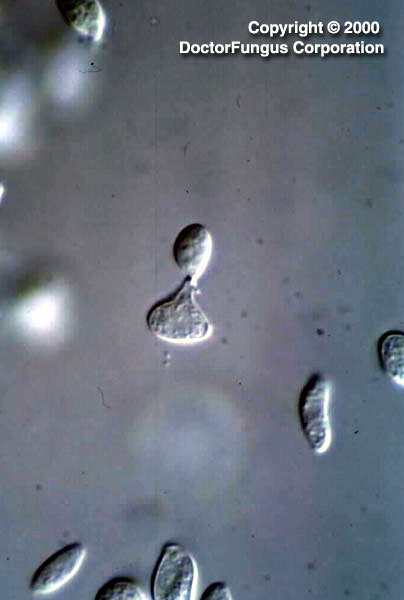 The yeast-like cells (blastoconidia, 2-12 x 3-35 µm) are the most common type of conidia and are oval to elongate in shape. Pseudohyphae and true hyphae are often abundant and well-developed. Ballistoconidia are one-celled, usually reniform (kidney-shaped), and are forcibly discharged from denticles located on ovoid to elongate vegetative cells. Once discharged, they function to produce satellite colonies. To see how the ballistoconidia are shot off, an inoculated plate is taped to an uninoculated one, face to face, with the inoculated plate on top, and the two plates are incubated for an extended period at 25°C. Following the incubation, colonies are produced on the initially uninoculated plate and form a mirror image of the colonies that were on the initially inoculated plate [1295, 2202]. Very limited data are available. In a study where very three Sporobolomyces salmonicolor isolates were tested, fluconazole generated highest MICs. Those of itraconazole, voriconazole, and amphotericin B appeared similar or lower than the fluconazole MICs .